Three-dimensional digital models of the lower deciduous incisor from Riparo Bombrini (left) and the upper deciduous incisor from Grotta di Fumane (right). A newly published study reveals that Homo sapiens belonging to the Protoaurignacian culture may have been the ultimate cause for the demise of Neanderthals. 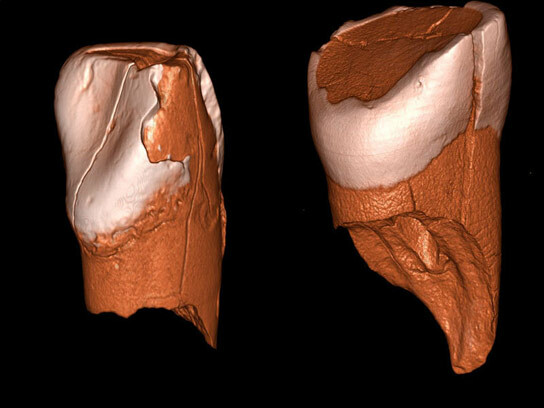 Researchers from the University of Bologna, Italy, and the Max Planck Institute for Evolutionary Anthropology in Leipzig, Germany, analyzed two deciduous teeth from the prehistoric sites of Grotta di Fumane and Riparo Bombrini in Northern Italy. The state-of-the-art methods adopted in this study attribute the teeth to anatomically modern humans. New AMS radiocarbon dates on bones and charcoal from the site of Riparo Bombrini, along with previously published dates for the Grotta di Fumane sequence, show that these teeth represent the oldest modern human remains in an Aurignacian-related archeological context, overlapping in time with the last Neanderthals. The results have strong implications for our understanding of the interaction between modern humans and Neanderthals, as well as for the debate on the extinction of the latter. Stefano Benazzi from the University of Bologna and colleagues from the CNR Institute of Clinical Physiology (Pisa, Italy) compared digital models from CT scans of the human tooth from Riparo Bombrini with those of modern human and Neanderthal dental samples. Digital methods were used to compare the internal features of the dental crown, namely the thickness of the enamel. The results showed that the specimen from Riparo Bombrini belonged to a modern human. Viviane Slon and colleagues from the Max Planck Institute for Evolutionary Anthropology were able to analyze the mitochondrial DNA from the Fumane 2 dental specimen, discovering that its mitochondrial genome falls within the variation of modern humans and basally in haplogroup R, which is typical for pre-agricultural mtDNAs in Europe. Sahra Talamo from the Max Planck Institute for Evolutionary Anthropology undertook a comprehensive program of radiocarbon dating to establish a firm chronology for the tooth from Riparo Bombrini, ascertaining that it is about 40,000 years old. Be the first to comment on "Modern Humans Triggered the Demise of Neanderthals"